In one of their assignments for teaching children’s literature my preservice teachers must seek out and identify high quality children’s literature and write about how they will teach those selections to today’s young readers. Most of the time, students find a host of titles that absolutely deserve to still make the cut when teaching children’s literature. But I still worry. I worry that my students are still overly selecting children’s literature that is dominated by print-text literacies alone. As we teach during the greatest communication revolution of all time, a time when to read is equally balanced by being literate with both visual-text literacies and print-text literacies, we must be intentionally purposeful about introducing young readers to high quality children’s literature that embraces teaching a balanced literacy stage with two co-stars, image-text and print-text. This month I found a unique and exceptional treasure to respond to this contemporary shift in literacy learning for today’s young readers. 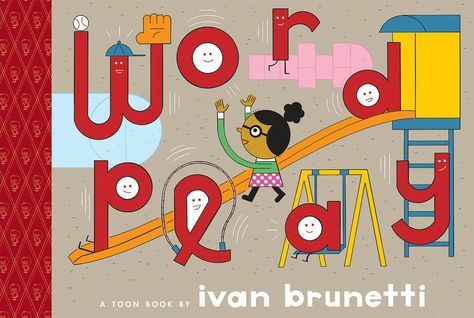 Ivan Brunetti’s Wordplay will now serve as my best example of a newly published, contemporary early reader comic that relies on both print-text literacies and visual-text literacies to teach English language learning. Why? Brunetti’s Wordplay is a linguistically alive and alluring language game we will all want to play over and over again. Seriously, just read it. Focused on teaching young readers about compound words, Worplay literally plays with words in a way that will never leave you – or your young readers’ – minds. Smart, witty, and just pure-plain-fun Wordplay is not only the best example I’ve ever found for teaching compound words in my last 20 years of teaching, but also the best example of how influential the relationship between print-text literacies and visual-text literacies can be when done thoughtfully and creatively by a seasoned storyteller. Plot: Annemarie (a compound word name) is learning compound words, and as she does so will you and your young reader. Directions: Reading aloud is an excellent way to encourage a love of reading. For this reason, this lesson plan encourages both educators and families to engage in playful and repeated read aloud activities with young readers. To begin, identify all of the compound words in Wordplay: homework, housework, homesick, housefly, mailman, milkmaid, handyman, playground, kickball, basketball, football, softball, eyeball, ballroom, butterfly, watchdog, bookworm, grasshopper, meanwhile, pancake, chickpea, eggplant, strawberry, blueberry, bedroom, bedtime, nightstand, moonlight, sleepwalk, sunflower, rainbow, riverbank, daydream, lunchtime, and goodbye. Next, write each compound word in large, readable letters on paper; make sure that each compound word can be hung and read from anywhere in the room. After writing each word, cut them into their two main, individual word pieces. Note: The individual words are going to be used to make a game for learning about and understanding compound words, just like Annemarie does in the story. Once the compound words are cut out and ready to be hung randomly sort them and place them on a table in front of a young reader(s). Now you are ready to read aloud with your young reader. As you come across each new compound word Annemarie learns in the story ask the young reader to identify each of the two individual words that make up the compound word in the story. Tell young readers to not only show you the compound word, but also say/read it aloud. When they have finished with each compound word keep reading the story and repeating this activity until the end. If a young reader struggles to identify the word help them out with clues and hints. You may have to read the story and identify the compound words many times until a young reader feels comfortable doing this activity on their own. Finally, put all the compound words back on the table and flip them upside down. Rearrange the words upside down (making them unreadable) and ask young readers to randomly select two words and play a game. For this game, ask young readers to use their two selected words and create a compound word with them. When they do they should read their compound word aloud and then decide if it is a compound word found in the story, a new compound word, or a silly compound word. Display the following three categories somewhere in the room and ask students to hang their new compound words in the appropriate category. When students are done identifying compound words from the story, creating new compound words, or finding silly compound words ask them to think like Annemarie and draw a picture of their favorite compound word(s) on a separate sheet of paper. Their piece of paper must list their compound word (spelled correctly) and a corresponding image of the student’s creation.